I first noticed Tomlike Mountain on a backpacking trip decades ago. For a modest peak in the northern Oregon Cascades, it was wild-looking. For some reason, I skipped Tomlike on my way to Benson Plateau. I found great views elsewhere but always wondered what I’d missed. On Labor Day of 2015, I found out. Yes, it was worth the wait–and the drive. A long hike up Herman Creek or some other point 45 miles or so from Portland would make the climb a solid twenty mile round trip. My gray hairs would need an extra day to recover from that. No thanks. A longer drive to Wahtum Lake cut the hike by more than half. It seemed a no brainer, so packed a bag and headed for Hood River. When I finally got to the trailhead, a few clouds hung overhead, and the brush in the lower elevations was still wet. I had to hope the clouds would clear. 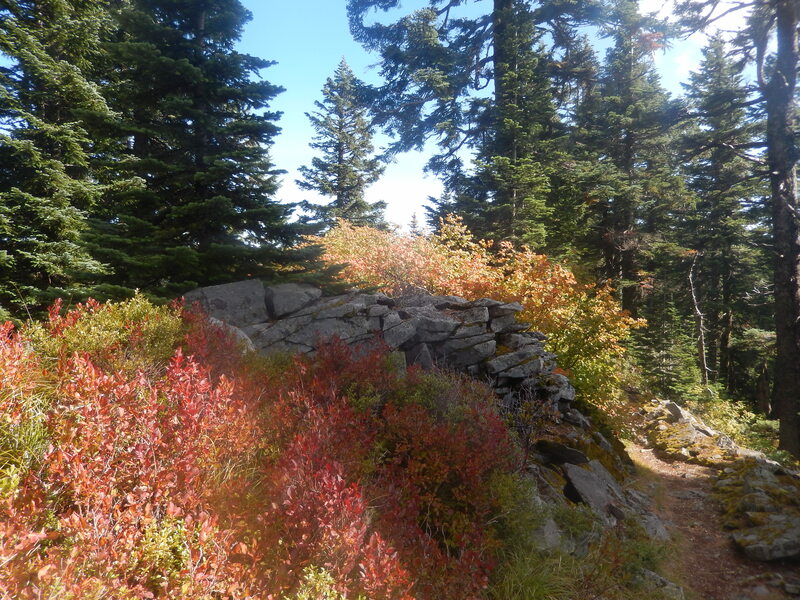 The walking was easy, as the trail arced around Wahtum Lake to meet with the PCT. I found no hikers until I neared the Tomlike herdpath peeled off of the Herman Creek Trail. Shortly after departing the main trail, the forest started opening up, the surface vegetation diversified, and the trail got rougher. This is not an official path, but it is relatively easy to follow. There is some thick brush, a few dead end spurs, and some rocky patches. It’s exactly the kind of hiking I enjoy–especially when the views started getting sublime. Herman Creek’s large canyon dropped away to the right, with the tiny puddle of Mud Lake at its base and rockslides scarring the canyon walls. As I climbed, I got a few views towards the summit, but it was a long and winding path to get there. The views continued astonishing me when I was fully above treeline. I enjoyed views in all directions, gawking back at Mount Hood’s majesty as well as tracing with my eye the route I’d followed years before to Chinidere Mountain and the obvious pancake spot of Benson Plateau along the mighty PCT. To the north, over the shoulder of a far ridge, the impressive mass of Mount Adams loomed in a fresh white coat of snow. I continued climbing, huffing and puffing just a bit. Tomlike Mountain’s summit was quiet and calm. I’d thought I’d need my jacket, but I remained in shirtsleeves. I contemplate the massive drop off to the west that felt like the escarpment on a much larger peak. As always, I was supremely content while sitting on that summit. THe views, the air, the earth beneath me all seemed so right. I had to get up for work at six a.m. the following day. There were bills to pay and chores to complete. For a few hours, however, not a bit of that mattered. The world was wild and beautiful and I was close to its essence. The movement of muscle, bone and tendon over mountain terrain is still invigorating even as it fatigues me more than in decades past. Tomlike Mountain charged my batteries for the week. This was a very satisfying hike. Descending a minor peak can be boring, especially when one is tired. That’s one reason I took a variation, the Anthill Trail, to return to my vehicle. Thankfully I was rewarded with a couple final wonderful photos opportunities. This is definitely an area to explore, with several other minor peaks nearby. For now, however, it’s back to work. Sunday was a perfect day for a hike. It was warm but not hot, the skies were clear, and I didn’t have to work. I always try to go somewhere new, but it’s harder and harder to do that when I have lived in the same corner of the globe decades. Thus I found myself surfing through the wonderful Oregon Hiker’s Field Guide website where I checked out some obscure spots. Then it hit me like a ton of noble fir limbs dropping on my head in a windstorm Duh! Larch Mountain. A road goes almost all the way up Larch Mountain, right below the summit crags of Sherrard Point. Many people were walking up the steps, including cyclists who had ridden up the 14 mile winding road east of Corbett. They really earned their views. The rest of us had but a five minute walk. are great, and little effort is required to get said views. The real hike lay below, in the old crater. descending one side to Multnomah Creek, and looping back up to the east. I spent little time on top, knowing I had miles to go. The descent is steady, and the forest gradually changes. I had seen a great meadow from the top, but the trail only skirts it. While there were few views on the hike proper, and a few too many other hikers (cry me a river, I know), I found lots to observe. The crater loop hike is about six miles long, and while the end of the loop felt a little underwhelming, I was happy to have completed the trek. It is a very worthy hiking destination. 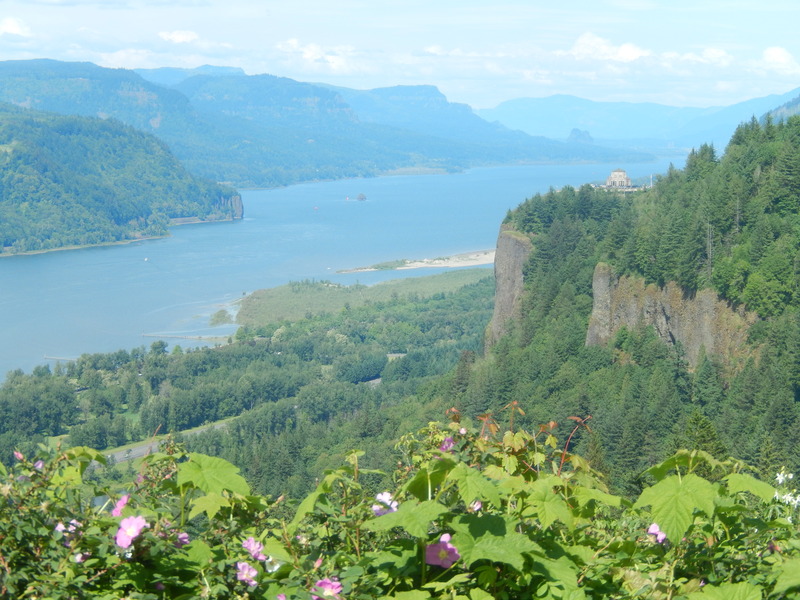 During World War II, military gun emplacements were constructed atop Aldrich Butte in the Columbia Gorge. The thinking was to defend Bonneville Dam below. Luckily, the guns were never needed (Fun fact: Oregon was the one continental state bombed in WW II). Concrete remnants of the fortifications are still on top of the butte. 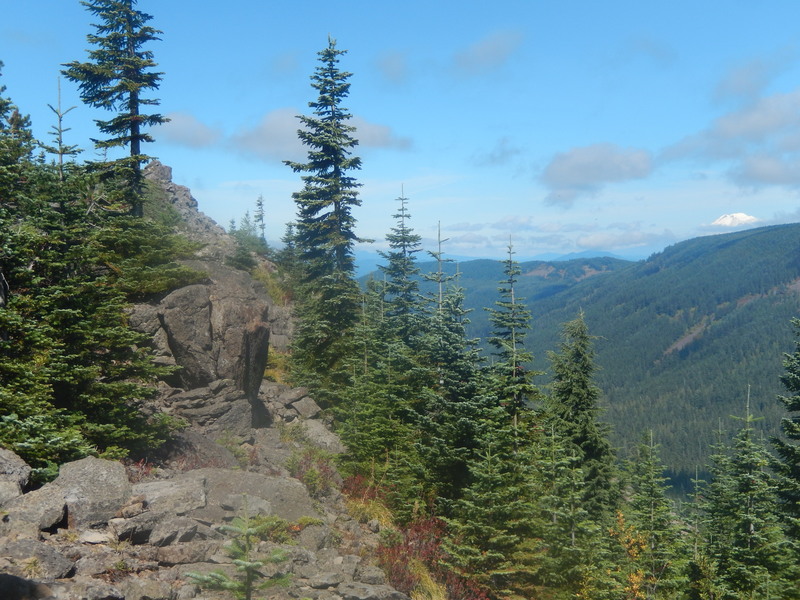 Aldrich Butte makes for a great short hike that can be modified with the addition of a hike to Cedar Falls and a loop trail return. The trailhead is a wide spot in a power line access road near the Bonneville Hot Springs resort. Soon the trail ducks into the trees on an old rocky road. The grade is casual, the mossy trees are spectacular in spots. After a bit less than a mile, a junction is reached at what passes for a lake at Carpenter Lake. It looks like a meadow but I assume it is rather boggy. The trail to the summit cuts back to the left and heads uphill more dramatically to a modest but very pleasant summit. I made it up in about 45 minutes. (My drive was longer than that) Concrete footings, presumably for the gun emplacements, are all over the place. I had to wonder how many similar spots were built up during the war years along the coasts of the U.S. This was my only day off this week, so I took my time to relax in the sun on top, enjoying the views of the Gorge. Despite seven or eight other vehicles at the trailhead, I saw no other hikers. Perhaps they were ninja hikers, or Special Forces troops testing new camouflage. It worked! I enjoyed my peaceful time. On the way down, I opted to take a variation loop back to the car. This was on an unimproved trail, included a side trip to Cedar Falls, the path to which was slightly sketchy. The side trail is very steep in spots, and there is no signage at all. If you have any navigational qualms, don’t do it. The falls were a secret little treasure. It is not a long way from a road, but this is not a roll-out-of-your-car-and-gawk waterfall. I half walked, half slid my way down a hard dusty trail hundreds of feet into the lush drainage to see the pristine cascade. I may have grumbled a bit at the return climb. I was dripping with sweat by the time I was back on the loop trail. Soon enough, the climbing stopped, and I easily made my way back to my vehicle. Maybe next time I will tackle the faint trail to Cedar Mountain above the falls. Denise and I drove over the Cascades on Sunday to see our nephew, who just graduated from high school in Bend. 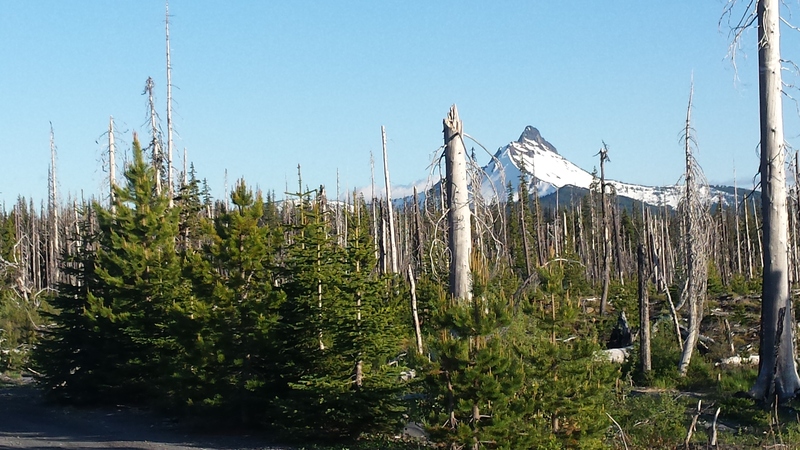 It was a quick trip, but we stopped near Santiam Pass and walked around. I hadn’t visited the area since a fire had come through in a recent summer. The views have opened up of Mount Washington to the south. Too bad it was just a tease, but the high country is still snowy. I can’t wait for the trails to open up. This will be a great area to visit in another few weeks. While on a trip to Washington last week, I managed a nice hike in the famed Issaquah Alps. I’d vaguely heard of Tiger Mountain, a famous destination in an area draped with trails, thanks to my sister who once lived nearby. The peak usually climbed is West Tiger #3. My approach would instead be from the east to scale East Tiger Mountain, which sounded easier at about four miles one way but still tips the scales at over 3000 feet. From the obvious parking area on the side of Highway 18, a dirt road wound slowly up the mountain. I figured the road was for fire access, but as it turned out, it was for cell tower workers. Three Ericsson trucks passed me at various points. Ah, life in the land of 4G. The smooth surface made for easy walking, and I tried to make tracks, as it were, since I needed be back in Federal Way before 3 p.m.
Jackie Chan and I didn’t stop until we ran into another man about my age with his own dog. Mine’s friendly. Mine too. Sniff sniff. We walked a bit faster than them and continued upwards. 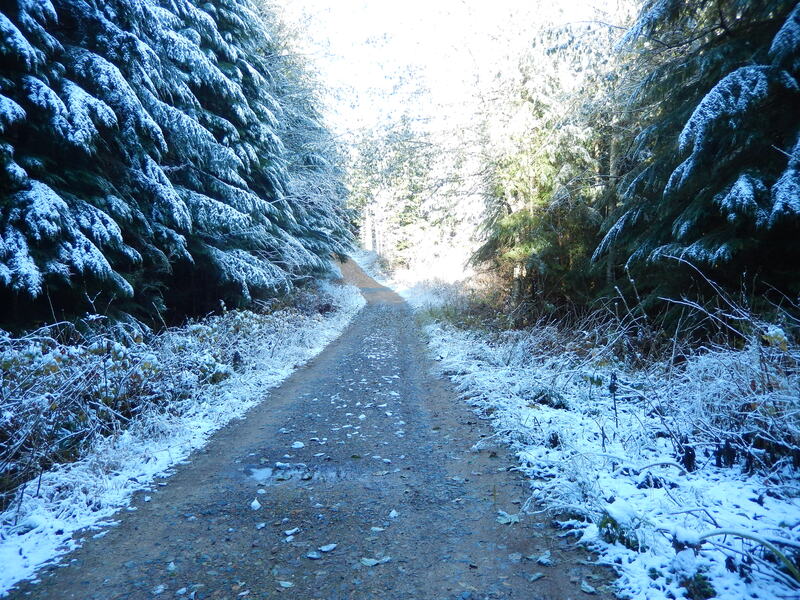 After two intersections, the trail headed upward in earnest and snow appeared on the sides of the road. 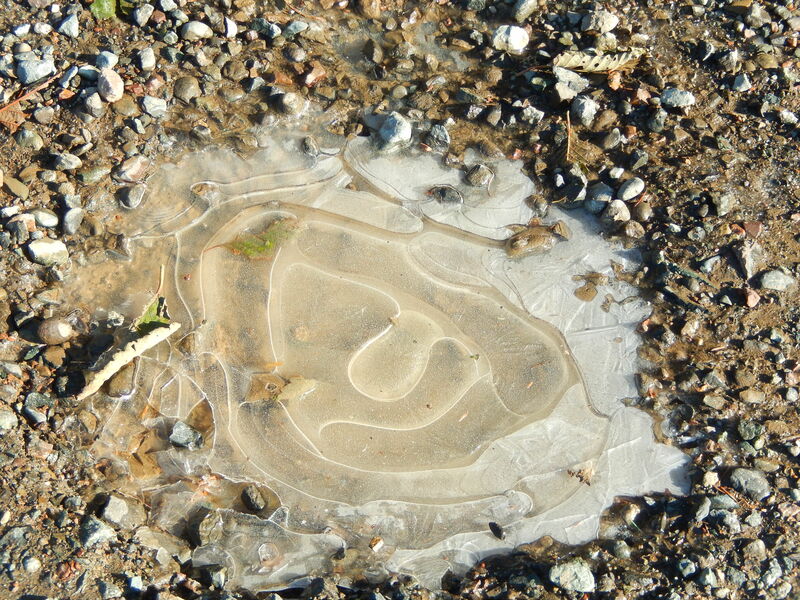 The walking surface itself got that crunchy permafrost feel, slick in spots. I motored through the cold on that north side stretch, trying getting the blood flowing. Jackie was a trooper as usual. A fantastic nurse log along the path. I arrived on top in about an hour and a half. The summit was not exactly wilderness, with the cell and radio towers, but there were still nice views, and blue sky above felt like a treat for a November day in the Cascades. Jackie sniffed about a bit but was mellow while I took photos. Then the other dog arrived and the romping began, Jackie trying to engage the other dog in a serious game of tag. He’s a funny little pup. I ignored it, although I kept remembering Marine Corps boot camp and how we didn’t put our hand in our pockets. That would be using “Army gloves”. I wore my gloves now, no problem. As I descended the first section, I passed a group of older folks decked out in serious gear, all gaitered and wearing heavier boots, while I wore trail runners. The snow never really stuck to the path, so I had no problems, although the cold did make it a bit more of an adventure. 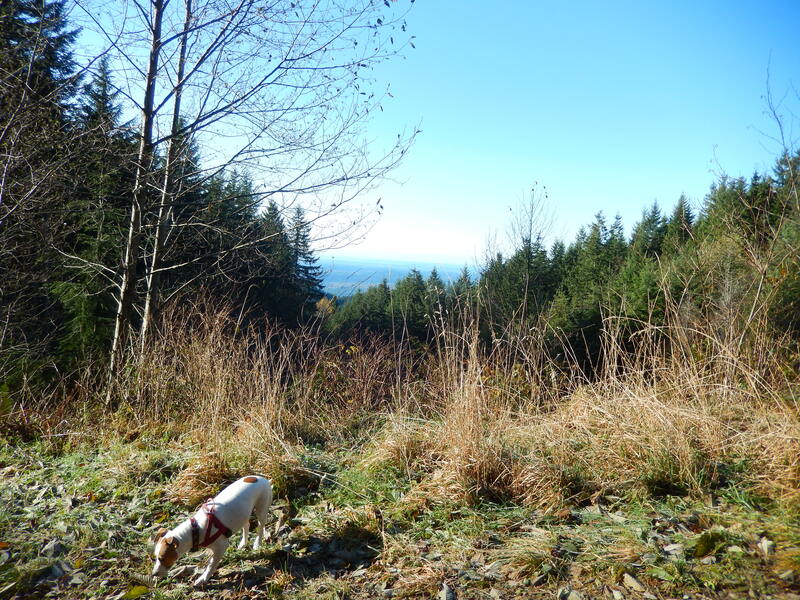 East Tiger Mountain is a nice area, and I’d recommend it for an easy walk any time of year, although visitors should know that the single track trails were closed to prevent damage to the trail, so mountain bikes may be on the road. It is surprisingly close to Federal Way, too. I got back to the hotel in less than forty minutes. Father’s Day is always a unique experience for me. I have a wonderful stepson, but my own father died when I was 17. While we did not have a perfect relationship, I try always to focus on the good memories, which often involved being outdoors. Dad was a former Marine and a Princeton graduate. He played sports into college and grew up hunting and fishing. He was tall, dark, and handsome too, so the bar was set high for me. On top of East Zigzag Mountain, Mt. Hood’s doorstep, Sierra Cup as codpiece, 1980. When I was young, the family spent time in the Adirondack Mountains, in a spot Mother had grown up visiting: Keene Valley, home of the high peaks. Small by western standards, the Adirondacks are rocky and rough peaks. Many peaks do not have formal trails. One of my earliest memories is watching the back of Dad’s legs as we clambered up a steep rocky trail to the summit of Noonmark Mountain. It is so named for its spot in relation to town. When the sun passed over the peak, it was approximately noon. As Dad and I hiked, he really appeared to be above me, a god of sorts. I was not yet five years old. Memories are imperfect, but I have always looked to that climb as the start of my lifetime love of the mountains, and my father was the one who led me there. Keene Valley was my mother’s childhood vacation home, and her love of the area was infectious, but it was Dad who opened up the trails and peaks to me. Other peaks followed in the coming years, including a semi-epic overnighter on Mount Marcy with my sister Hannah, where we were beset by a storm shortly after descending from the rocky summit cone. As I grew up, I also hiked with a group, the ATIS (Adirondack Trail Improvement Society), but my trips with Dad were special. Our family moved from New York to Oregon when I was 12, and I became a mountaineer as a teen, summiting volcanos and crags around the Northwest. 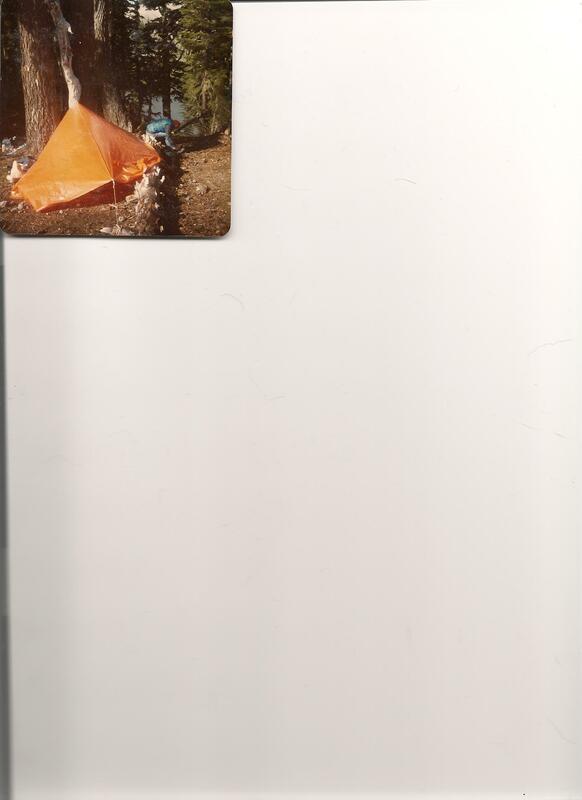 I surpassed Dad in mountain experience, doing multiple weeklong backpacking trips in Oregon, Idaho, and Montana. The mountains were my life, and Dad seemed more distant, caught up in a struggling business. 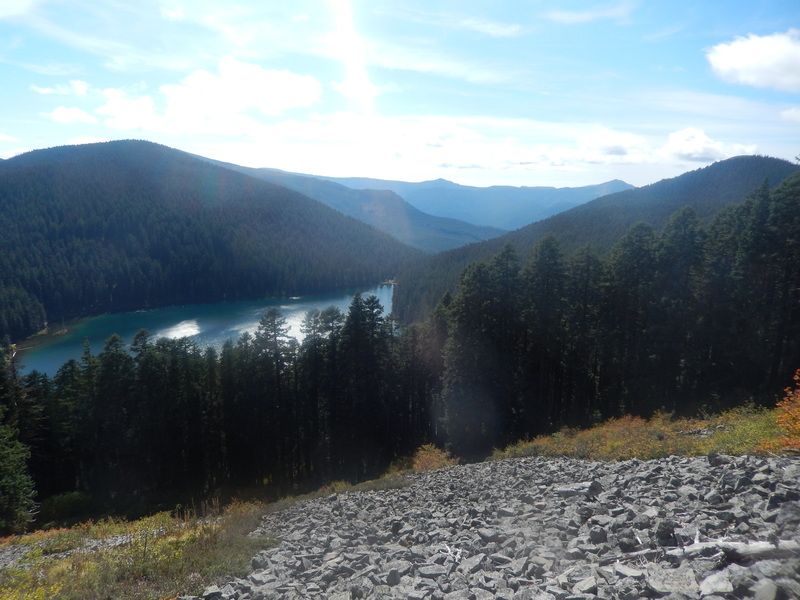 we continued hiking, hiking to Burnt Lake, climbing small Cascade peaks like East Zigzag Mountain and Grizzly Peak. He finally took a mountaineering course, climbing multiple major peaks in Oregon. It was one way we bonded, even as I was being a standard issue rebellious teen. Dad showing off newly active Mt. St. Helens. 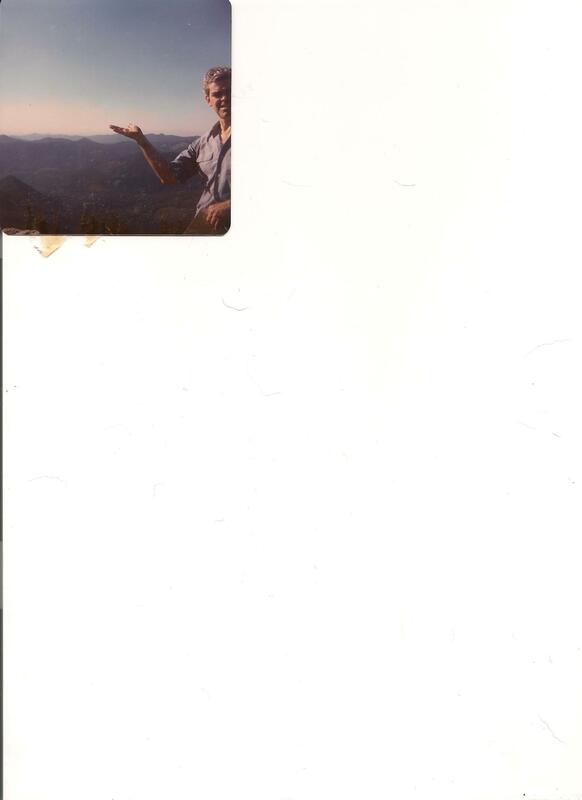 Atop East Zigzag Mountain, 1980. In September of 1980, we planned a climb of the South Sister. Somehow, in a comedy of errors, mostly my impetuous teenage fault, we were separated between the trailhead and parking lot. I realized there was a shortcut to the trail from the back corner of the parking lot, and I made foolish assumptions. I didn’t wait for him; I hiked onward, thinking he had taken the shortcut and was ahead of me and that I was supposed to catch up to him. When I didn’t find him along the trail or on the shores of Moraine Lake a couple miles later, I was at a loss, knowing I had screwed up. I searched for him to no avail. Dad had our tent, but I was able to rig a tarp as shelter, and spent a nervous night alone. My shelter at Moraine Lake. In the morning, I packed up and headed back toward the trailhead. Passing hikers already knew who I was. Dad had contacted the search and rescue team. The situation was both embarrassing, comic, and ultimately, reflective of his paternal love. My father could be gruff and tough, but he also was full of love, and he wanted nothing more than to protect me. We had other adventures, and Dad continued exploring the mountains until a heart attack took his life while he jogged in the Portland hills on a February morning in 1982. I believe that Dad loved the mountains as much as I do, that they were a place for him to relax and reflect as well as a place to have grand adventures. I have had many subsequent adventures and learned many lessons about life because of them. I only wish we could have had more of those experiences together. 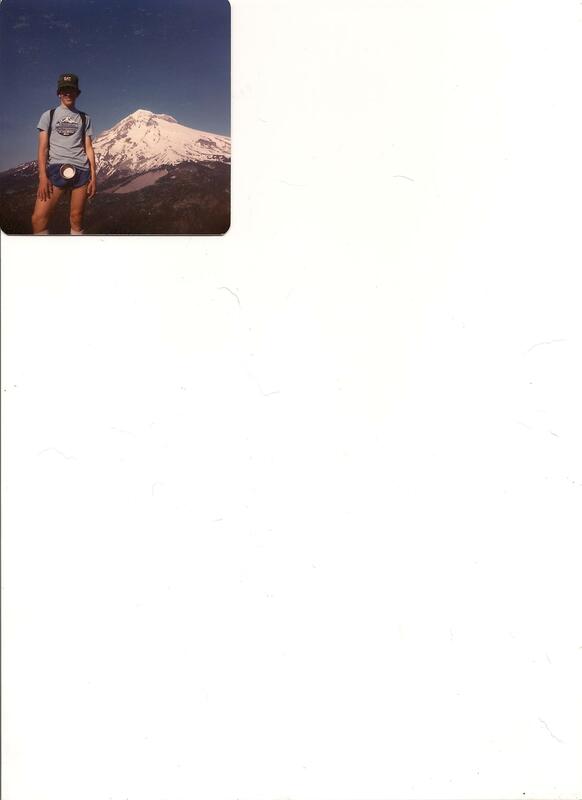 My father’s ashes were scattered over the noble Mount Hood. I miss him every day.